Delaware allows you to complete your divorce without an attorney if you and your spouse can come to an agreement on what to do with your property and how you will care for any children that you have. Either you or your spouse must have lived in Delaware for 6 months before filing for divorce. Delaware is a no-fault divorce state. In a Delaware no-fault divorce the spouses agree that "the marriage is irretrievably broken and that reconciliation is improbable." File the Petition for Divorce and other divorce documents with the Clerk of the Family Court. A judge completes your divorce by signing your Decree of Divorce, which will be mailed to both parties. 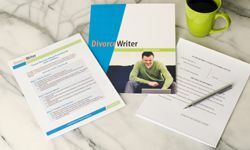 DivorceWriter provides forms specific to the state of Delaware and offers a money back guarantee if your documents are not accepted by the Court. You have qualified to use DivorceWriter to complete your Delaware divorce papers online. Select "Continue" to start the interview.